MAC, Clinique, Avon, and L'Oreal: what do these big cosmetic brands have in common? Unfortunately, the answer is not anything good. All of these companies test their products on animals. Cosmetic product testing results in millions of animals worldwide living their entire lives in cages. In these testing labs, they are subjected to painful and unnecessary treatments, including having cosmetics dripped into their eyes, forced down their throats, and rubbed into their shaved skin. But there is an alternative to all of this unnecessary suffering! 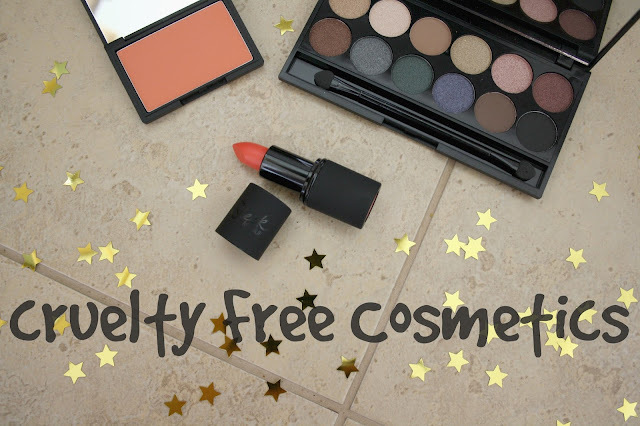 There are many amazing cruelty free companies out there, meaning that turning your makeup bag cruelty free is simple! And guess what? You don't have to compromise on product quality either! One of these amazing cruelty free brands is Sleek MakeUP. I was offered the chance to showcase a few of their products to you and I leapt at the opportunity! I'm no makeup expert by any means, but I hope you'll enjoy reading my thoughts nonetheless. The first item that I was gifted was the iDivine Eyeshadow Palette in Storm*. The palette contains 12 varied shadows, a mixture of highly pigmented matte and shimmer shades. I've swatched a few of my favourites below. I found that Snow Storm was the perfect shade for placing in the inner corner of my eye, and it blends into Thunder Storm and Sand Storm just beautifully. All of the shades had a great staying power and I was impressed with their longevity! 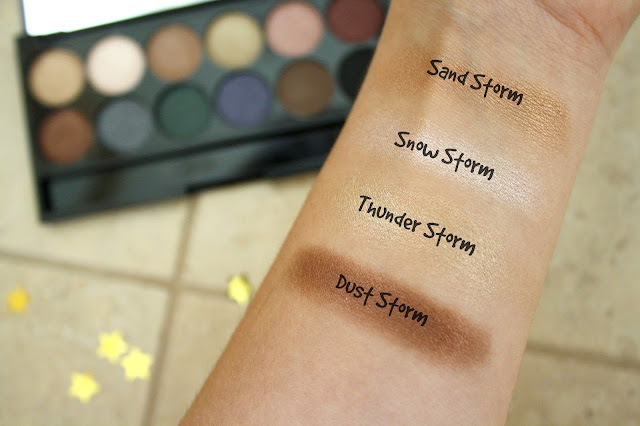 The Storm palette is also really inexpensive, costing just £8.99, so the palette is great value for money. As well as the Storm palette, I was invited to try one of Sleek's True Colour Lipsticks in Papaya Punch*. This wasn't a colour that I'd normally pick out for myself, so trying out this product was a step outside of my comfort zone. However, I'm really pleased that I gave it a go! The consistency of the lipstick was very moisturising and I didn't even need a lip pencil or priming product to achieve a strong and lasting colour. A few top-ups of the lippie were necessary throughout the day, but on the whole I was very pleased with the wear of the product. The final product that I sampled from Sleek was a blush in the shade Life's A Peach*. A little of this goes a very long way - it is very pigmented. I applied the blush to the apples of my cheeks and I was very satisfied with their peachy glow! Below you can see a look that I created using my new Sleek products. I'm wearing a combination of the Storm eye shadows, and the Life's A Peach blush on my cheeks. 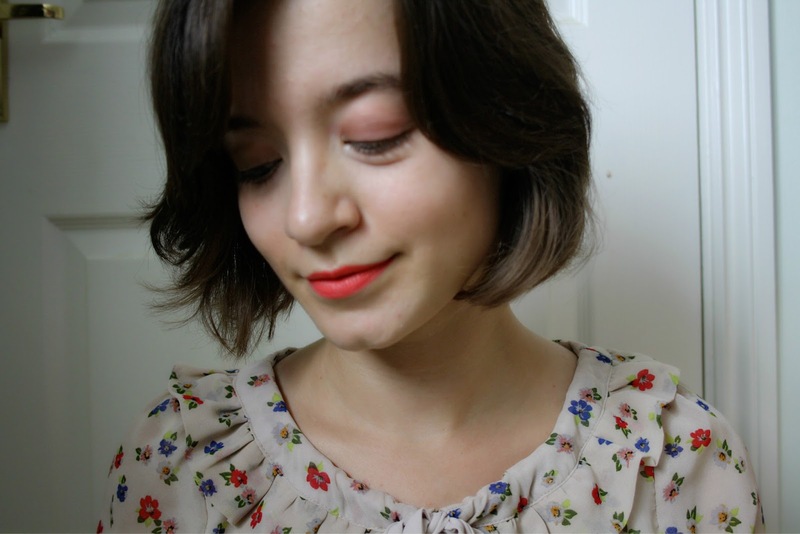 On my lips you'll see the Papaya Punch lipstick in action. So, next time you're at the makeup counter, just think: Does the world so desperately need eyeliners, lipsticks, and foundation that it's worth putting our animal friends through such misery? I don't think so, especially not when there are fabulous, ethical alternatives from brands such as Sleek MakeUP on the market. What is your favourite cruelty free makeup brand? All recommendations welcomed in the comments! * Disclaimer: All products marked with an asterisk were sent to me for free in exchange for a review.